It's officially comfort-food weather, and what could be more satisfying than carbs on a cold night? It's typically the first thing we reach for on a moody winter's day—or these crockpot recipes. Well, it's only natural, right? But while every healthy diet needs carbs, you can have too much of a good thing, and ain't nobody got time for those extra calories. So what's the answer? How can we curb our carb cravings without the extra baggage? Enter the spiralizer. This unique kitchen gadget turns all your favorite vegetables into delicious zoodle recipes you can add to any meal. Just ask Inspiralized founder Ali Maffucci. The self-confessed spiralizing fanatic has made this new style of eating fun, easy, and tastier than ever, with two best-selling cookbooks to prove it. Ever since Maffucci first tasted zucchini noodles in a New York restaurant, she was hooked. "I immediately thought, Wow, this tastes just like real pasta," she told MyDomaine. "If I added a nice hot sauce, I bet it would be even better. Once I did, I knew spiralizing was special, and I was surprised that there were barely any recipes on the internet for it, and no one I asked knew about it." After a couple months of spiralizing, Maffucci quit her corporate job and dedicated her time to building a resource and community around spiralizing. "I've never looked back," she said. Ahead, Maffucci shares the secret to making zoodles taste like real pasta, the 26 vegetables you can spiralize, and simple ways to incorporate more veggies into your diet. At the end, you'll also find two exclusive low-calorie, low-carb spiralizer recipes you can make at home. MYDOMAINE: There are a lot of kitchen gadgets out there, but the spiralizer really has spiraled out of control. Why? 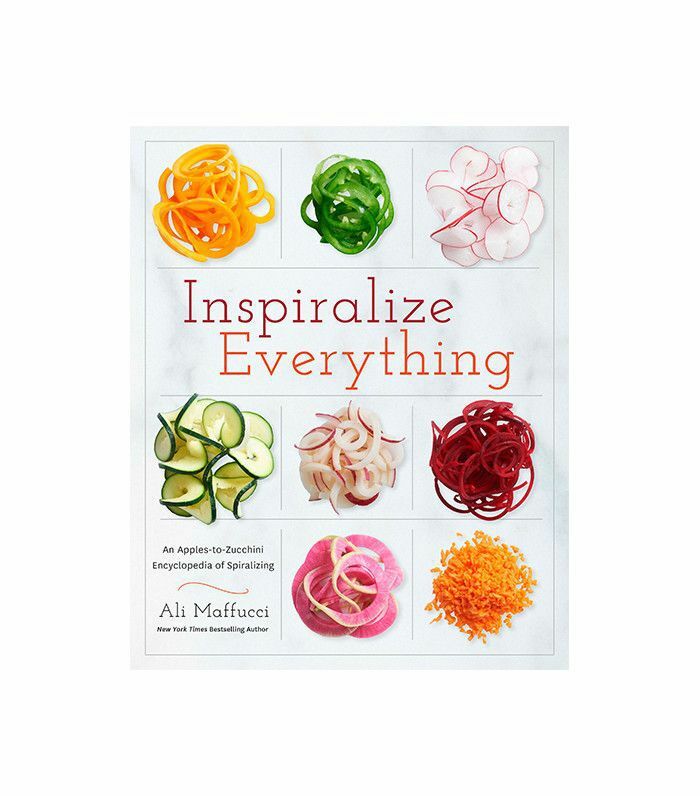 ALI MAFFUCCI: The spiralizer has become so popular because it lets us all have our cake and eat it too. We can eat our favorite meals (like Italian pastas and Asian noodle bowls) while still committing to a healthy lifestyle. Who wouldn't want to devour a bowl of spaghetti Bolognese without the heavy carb coma? Also, the spiralizer helps us eat a bit more creatively, and I think that's important. It reconnects us with the food on our plate. Healthy eating doesn't have to mean a bowl of diced veggies anymore. Instead, it can be a heaping bowl of spaghetti and meatballs or ramen. It empowers even the biggest haters of vegetables to cook with veggies more regularly. MD: For those who are still new to this style, what are some of the ways in which you can use a spiralizer? Make Asian-style noodle bowls like pad thai, ramen, pho, etc. Bake the noodles into casseroles. Use the spiralized veggies in pasta salads. Create side dishes using spiralized veggies. Add spiralized veggies into soups and stews, like the minestrone soup with zucchini noodles from my second cookbook, Inspiralize Everything. Toss spiralized fruit noodles into salads. Make healthy, oven-baked fries using russet potatoes or sweet potatoes (they also work well as salad and burger toppings). I also take it a step further and make "spiralized rice" by putting the spiralized vegetables into a food processor and pulsing until rice-like. My favorite rice recipes are the sweet potato fried rice from my first cookbook and the turnip risotto with crisp pancetta and chives. MD: What should be cooked, and what can be eaten raw? AM: If you can eat a vegetable raw normally, you can eat it raw spiralized. Spiralizing doesn't change the make-up of a veggie; it just changes its shape! I recommend eating raw cucumbers and zucchinis with a light sauce like a vinaigrette or pesto. I recommend cooking most spiralized veggies, especially sweet potatoes and rutabaga, which aren't eaten raw. MD: How can you use spiralizing to sneak more veggies into your meals? AM: You can add spiralizing vegetables in at every meal. Whether you're throwing zucchini noodles into a cookie batter or using them as a pasta base, their consistency is perfect for sneaking in veggies. When you're eating a big bowl of pasta with a tomato sauce and some Parmesan cheese, you won't even realize you're eating a bowl of vegetables. MD: What are some of the vegetables that can be spiralized? MD: For those who love pasta, zoodles are a great alternative, but they don't taste like pasta, do they? How do you make zoodles taste like our favorite comfort food? MD: Why should we replace pasta with zoodles? AM: We all should be eating more vegetables. It's part of a healthy diet, and in my opinion, spiralizing is the tastiest option for doing so. MD: What are your favorite spiralizer meals and why? AM: I eat the vegetarian meatballs and celeriac spaghetti from my second cookbook, Inspiralize Everything, a lot. I make the meatballs in advance, freeze them, and then reheat them with a different spiralized vegetable each week: zucchini, celeriac, sweet potato, rutabaga, parsnip, kohlrabi, etc. No more healthy-eating boredom. MD: What should you NOT do with a spiralizer? AM: Spiralize meat, cheese, or chocolate. I've tried it, and it's just a mess. "If I had a nickel for every time my grandfather served us broccoli rabe and sausage, this cookbook would be gold-plated. This combination is classically Italian, thanks to the undeniable spicy power of the sausage and the slightly bitter kick of the broccoli rabe. The parsnip noodles become the star of this dish, absorbing the sauce created by the olive oil and sausage juices. The Parmesan cheese ties everything together, bringing in a silky texture, a slightly salty taste, and a savory aroma. Salute! Also works well with zucchini, butternut squash, celeriac, rutabaga, or turnip. Rinse the broccoli rabe and pat dry. Cut off most of the stems (the thickest parts). Using a vegetable peeler, pull some skin off the stems, and continue to until you hit the leaves. Chop into 1-inch pieces and set aside. Place a large skillet over medium heat. When water flicked onto the skillet sizzles, add the sausage and oregano and cook, breaking up the meat with a wooden spoon, for 6 to 8 minutes, or until browned and cooked through. Using tongs or a slotted spoon, transfer the sausage to a plate. Immediately add the broccoli rabe, parsnip noodles, garlic, and red pepper flakes to the skillet. Season with salt and black pepper, and then add the broth. Cook until the broth has reduced and the parsnip noodles are al dente, about 5 minutes. Return the sausage to the skillet, add the cheese, and stir to combine. Remove from the heat and toss the ingredients to combine fully. Divide among four plates, garnish with the parsley, and serve. "I distinctly (and lovingly!) remember my mother fixing me 'turkey roll-ups' for after-school snacks. I loved dipping them into mustard and munching on them while telling her about my day. Now I've re-created that childhood memory into something a little more grown-up. The spinach and crunchy cucumber noodles add texture and vitamins, and the hummus packs in more protein and flavor. Whether you're looking for a snack for your children or something to pack for yourself at the office, these roll-ups are satisfying and, most important, fun to eat." Lay out the turkey slices on a clean, dry surface. Spread 1 tablespoon of the hummus on each and top evenly with hemp hearts. On the short-side end farthest from you, add about 1/4 cup of the spinach leaves to each, and then top with about 1/4 cup of the cucumber noodles. Roll it all up like a burrito. Secure with a toothpick if needed, and drizzle with or dip into hot sauce.